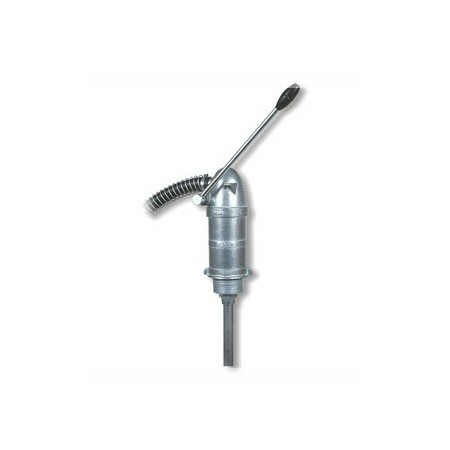 Fill-Rite FR112 Heavy Duty Rotary Hand Pump is self-priming, for field transfer of medium viscosity liquids, oils, gasoline and diesel fuels at up to 10 gallons per 100 revolutions. 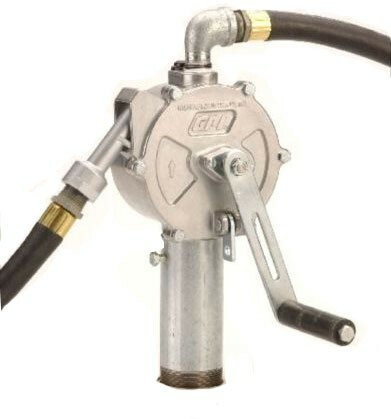 Fill-Rite FR112C Rotary Hand Pump is self-priming, for field transfer of gasoline and medium weight oils at up to 10 gallons per 100 revolutions. 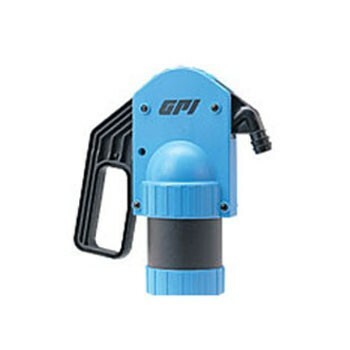 GPI HP-100-UL 114000-10 Dual-Flo premium hand pump generates twice the flow of any other hand pump with double action piston technology. 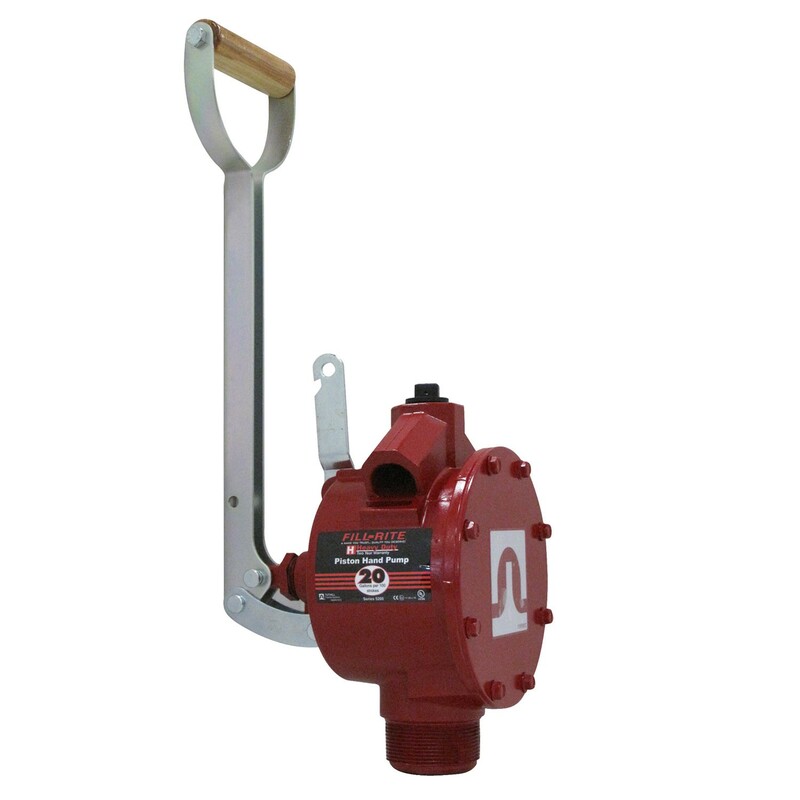 This economy fuel hand pump moves fluid on both the push and pull stroke at up to 25 gallons per 100 strokes. Fits 2" NPT bung. 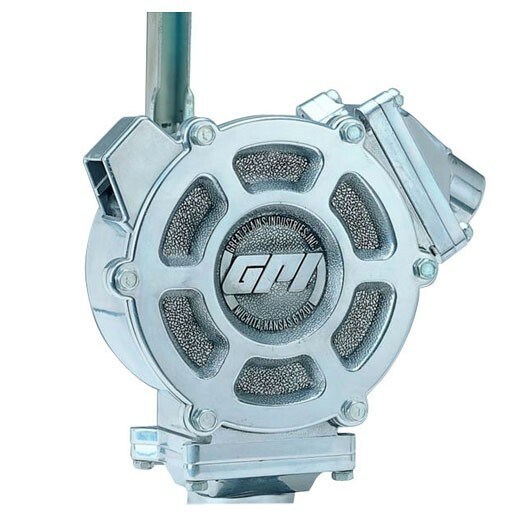 GPI LP-50 129000-1 lever pump delivers fluids at rates up to 1 Pint per stroke. 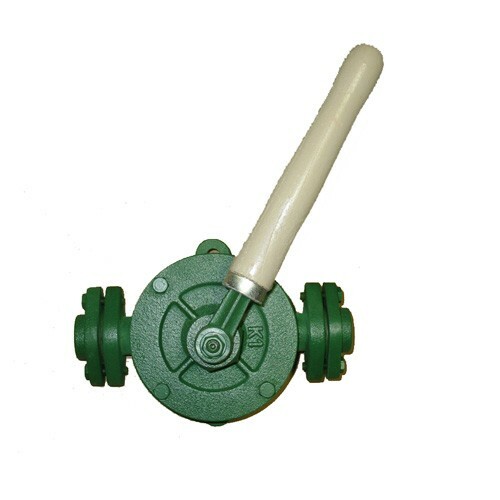 This GPI hand pump fits 2" NPT bung. 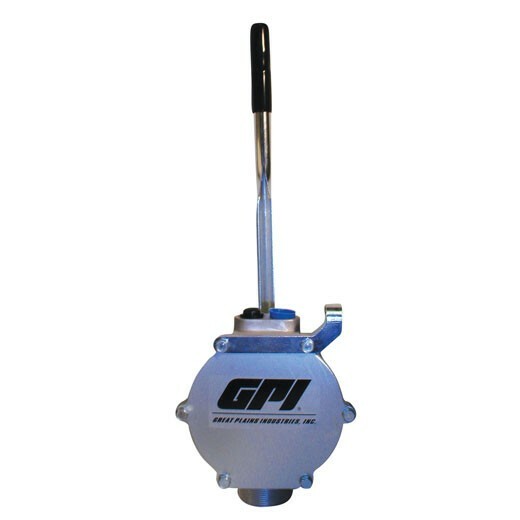 GPI RP-10-UL 123000-6 Rotary Hand Pump is self-priming, for field transfer of gasoline and medium weight oils at up to 10 gallons per 100 revolutions. 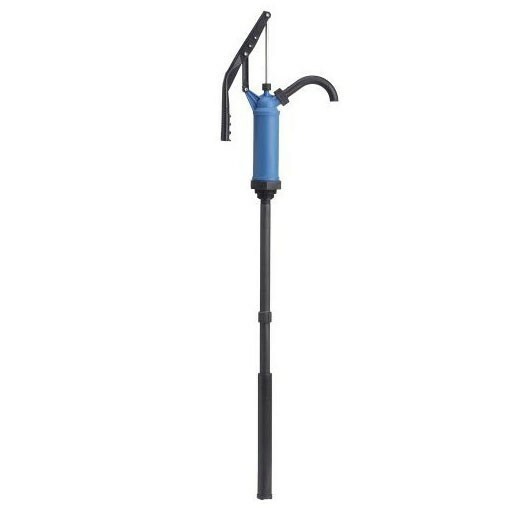 GPI RP-5 129003-1 Rotary Hand Pump fits a 55-gallon barrel and is self-priming, for light-duty fuel transfer at 8 gallons per 90 revolutions. 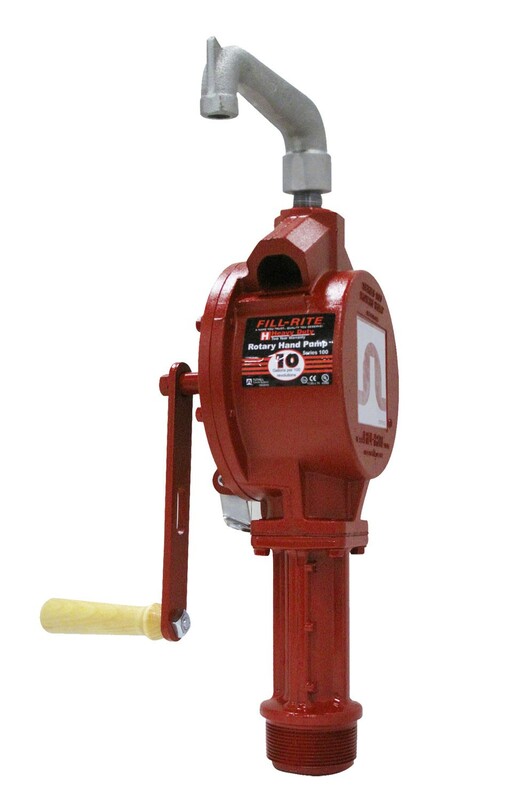 Fill-Rite FR31 Cast Iron Hand Pump dispenses oil or other noncorrosive liquids at rates up to 1 quart or liter per stroke. Comes with drain tube and suction pipe. 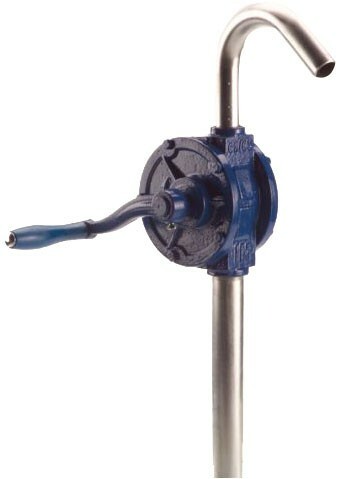 Fill-Rite FR20V lever pump delivers fluids at rates up to 1 fluid ounce per stroke. Perfect for barrels, storage tanks and drums. 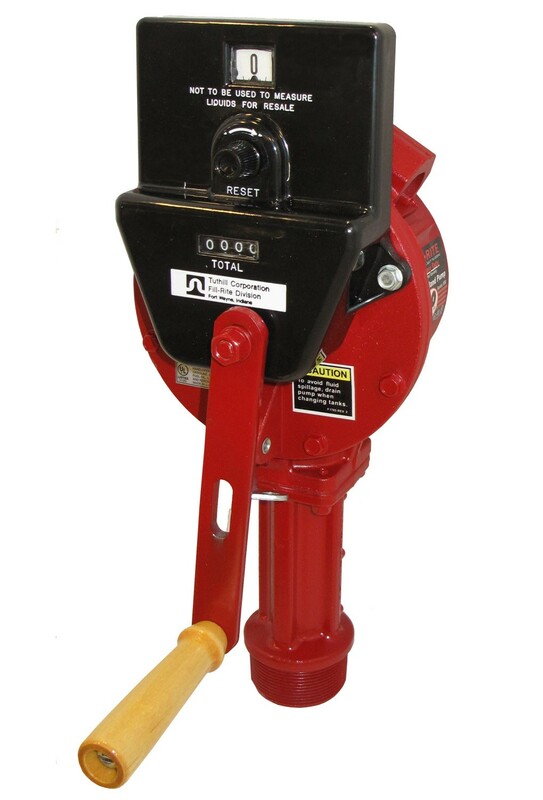 Fill-Rite FR152 Hand Piston Pump delivers diesel, gasoline and variety of fluids at rates up to 20 gallons per 100 strokes. Comes with steel telescoping tube and nozzle spout. 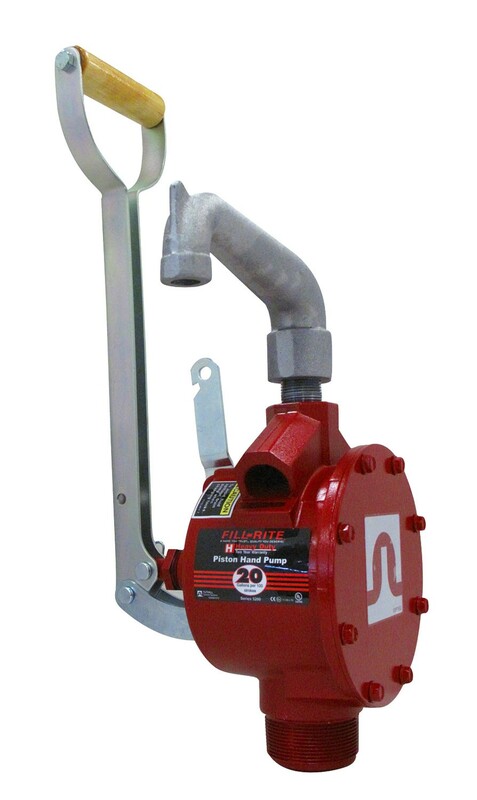 Fill-Rite SD11 Lever Pump is lightweight hand pump for field transfer of diesel and light oils at up to 11 ounce per stroke. 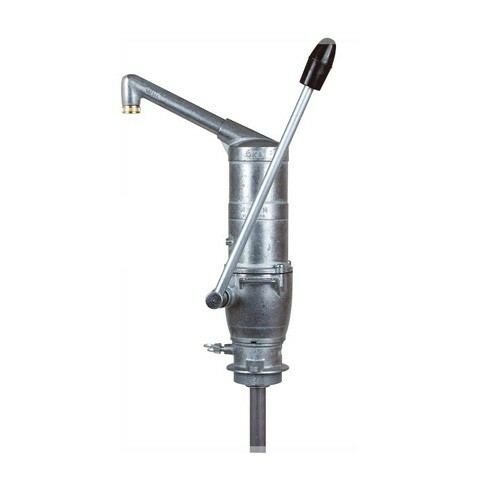 Fill-Rite FR110 Heavy Duty Rotary Hand Pump without accessories is self-priming, for field transfer of medium viscosity liquids, oils, gasoline and diesel fuels at up to 10 gallons per 100 revolutions. 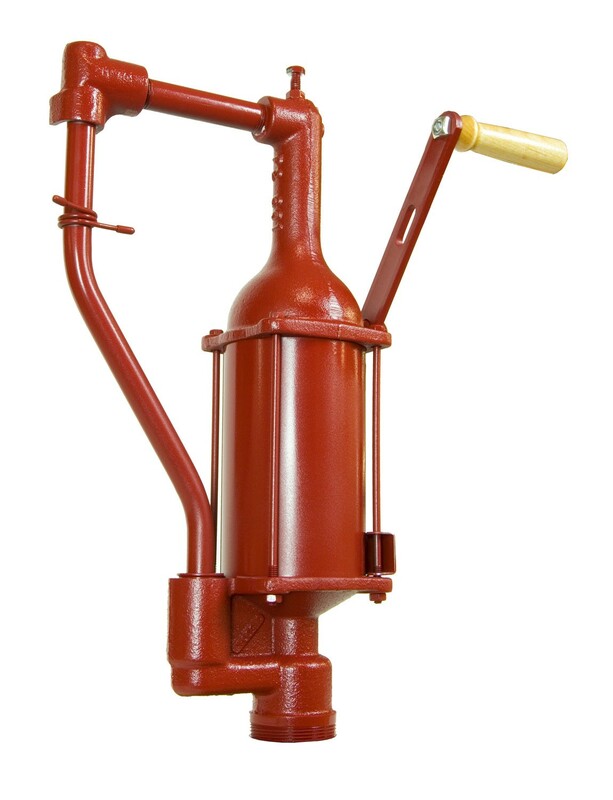 Fill-Rite FR112CL Rotary Hand Pump is self-priming, for field transfer of gasoline and medium viscosity oils at rate up to 37 liters per 100 revolutions. Fill-Rite FR113 Heavy Duty Rotary Hand Pump is self-priming, for field transfer of medium viscosity liquids, oils, gasoline and diesel fuels at up to 10 gallons per 100 revolutions. Comes with telescoping steel suction pipe and pail spout. 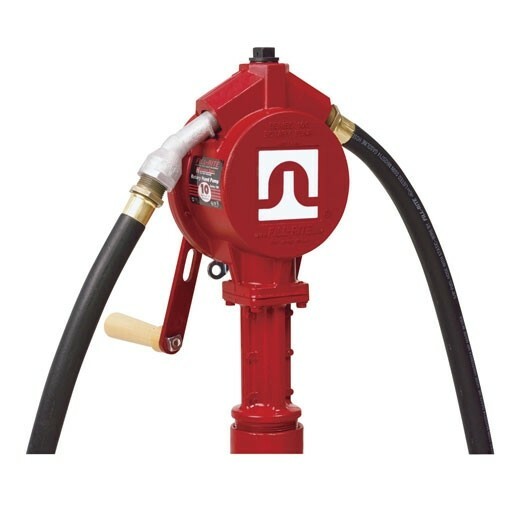 Fill-Rite FR150 Piston Hand Pump (Pump Only) delivers diesel, gasoline and variety of fluids at rates up to 20 gallons per 100 strokes. 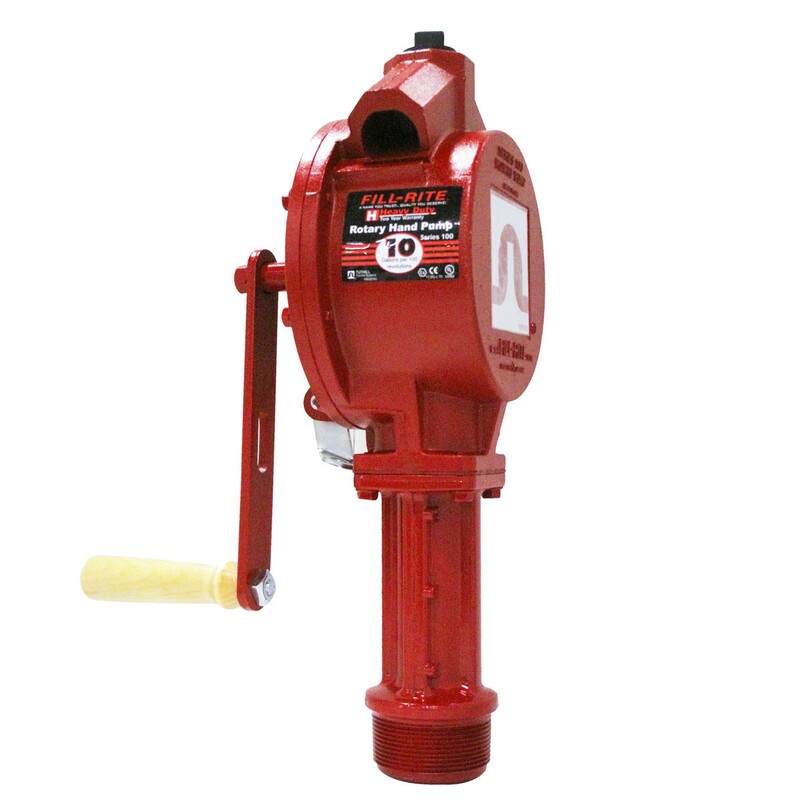 Fill-Rite FR151 Piston Hand Pump delivers diesel, gasoline and variety of fluids at rates up to 20 gallons per 100 strokes. Comes with Steel Telescoping Tube and Pail Spout. 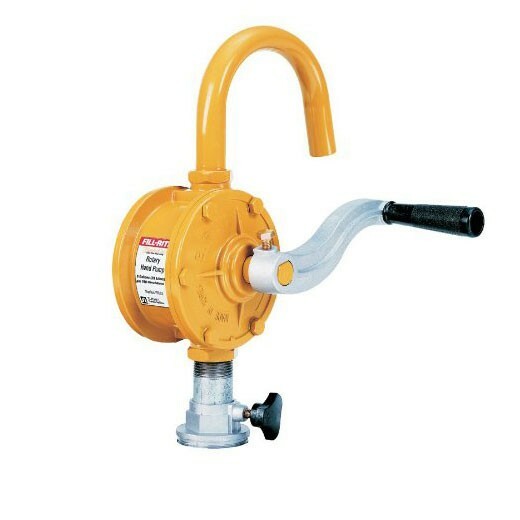 Fill-Rite FR156 Piston Hand Pump delivers diesel, gasoline and variety of fluids at rates up to 20 gallons per 100 strokes. 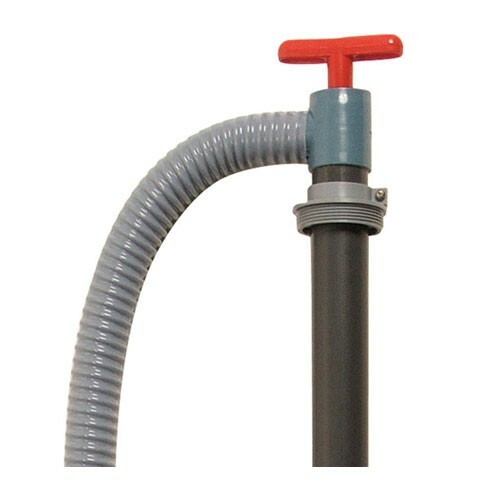 Comes with 3/4" x 8' NPT Hose, Telescoping Steel Suction Pipe, Nozzle Spout, w/ 807C Meter. 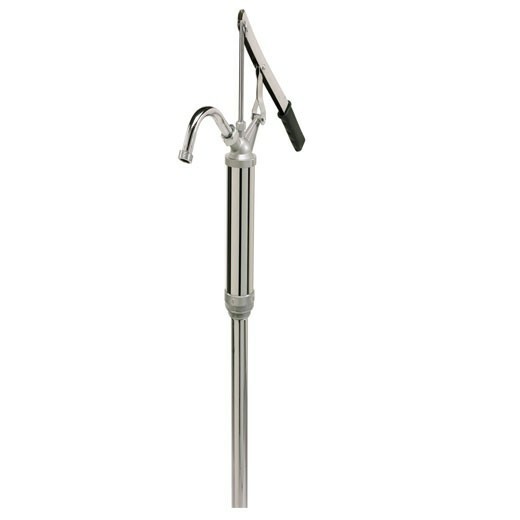 The Tecalemit US103089100 K10C Hand Pump is a single action hand pump for various approved products, from drums to above ground storage tanks. Delivers fluids at rates up to 0.6 gal per stroke. 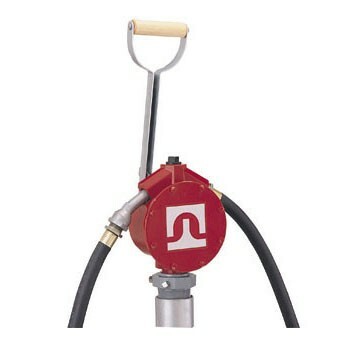 The Tecalemit US122029100 OK9 BS Oils Hand Pump compatibles with engine oils, and hydraulic oil up to SAE 80. Delivers fluids at rates up to 0.6 gal per stroke. 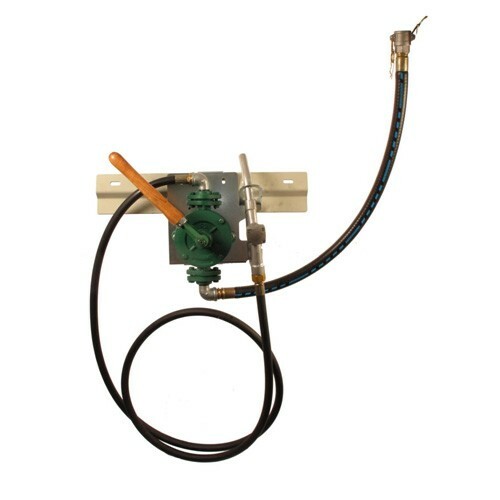 Western Global PKTK1N is a manual fuel transfer pump kit with a 12' x 3/4" hose, 3/4" inlet fittings & manual nozzle. Delivers up to 10 GPM. Western Global PKTK1P is a semi rotary fuel pump for dispensing good volume of diesel fuel remotely from storage tanks. 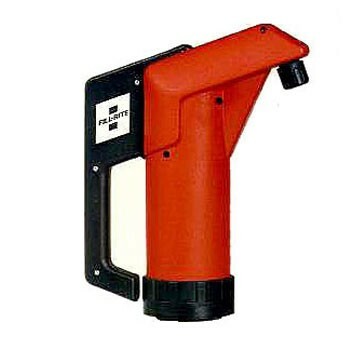 Pump fitted with 2m suction hose & 4m delivery hose, nozzle holder & manual trigger nozzle. Delivers up to 20-40 LPM.